Write your next document and draw your next self-portrait with smooth precision and accuracy on screen with the Dell Active Pen - PN557W. With up to 2,048 levels of pressure sensitivity, the pen is like a natural extension of your hand, picking up the slightest nuances of pressure. You'll be able to create strokes of varying lightness or darkness with a level of control that a mouse can't even come close to providing. 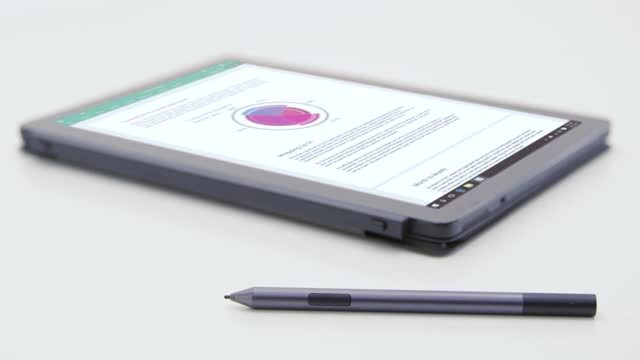 Plus, you'll be able to rest your palm comfortably on the screen without having to worry about potential errors thanks to palm rejection technology. The pen is intuitive to use and designed to make your drawing and writing more productive than ever. Click the customizablei top button to instantly launch OneNote, capture a screen shot or activate Cortana. Use the customizablei 2 barrel buttons to efficiently erase or launch the select arrow/context menu. You'll also be able to conveniently take notes by writing on the locked screen. When you're done writing and drawing, simply snap your magnetic pen onto your laptop or securely attach the pen to your laptop with a pen tether so you won't lose your pen when you're not using it. Be productive longer and enjoy peace of mind with 12 months of battery lifei.